Explore the more transcendent qualities of life on the Network. 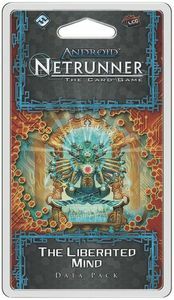 The idea of an expanded consciousness runs throughout The Liberated Mind, the fifth Data Pack in the Mumbad Cycle for Android: Netrunner, and you'll find the mysterious Temple of the Liberated Mind given shape, alongside several of its members and their philosophies. Sixty new cards (including a complete playset of nineteen different cards) allow Runners to explore life, death, and rebirth in the virtual realm. Meanwhile, Corps gain new means to counter the Runners' efforts and to use the Runners to further their own agendas.